Elegant décor provides the ideal setting for the contemporary cuisine. 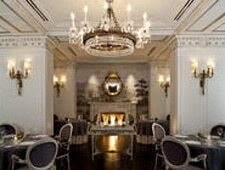 : This tony restaurant in The Jefferson hotel’s lobby takes hobnobbing and haute cuisine to a new, and possibly un-Washington-like, level. Ought this restaurant with its army of staff and silken surrounds be better housed in, say, some ritzy townhouse in Manhattan’s Upper East Side? It isn’t, of course, but its highly polished service, attention to detail, and menu, now overseen by executive chef Christopher Jakubiec, are not geared for casual diners. Plume spells “destination dining” and you’d better be dressed and ready for action. Escorted to your seat---ladies, you’ll even receive a stool for your purse---you are fussed over by waiters who will take your drink order (why not Champagne? ), explain the evening’s special, and hand you a handsome menu with such offerings as roasted eggplant tian with preserved tomato, grilled diver scallops and golden beet risotto, and Prime beef filet paired with oxtail and foie gras ragoût. As the meal progresses, you’ll be served an amuse-bouche to tempt your palate and an offering of bite-size chocolates and confections with the bill. Note that the restaurant's wine list may seem daunting, but the knowledgeable sommelier will provide guidance.